If your cat is increasingly vocal at meal times or trying to swipe any food within reach (including yours), there might be a good explanation. It’s dinnertime, and you’re preparing to fill your cat’s food dish. While you poke around the kitchen and rummage for the food scoop, your cat is rubbing up against your legs and vocalizing louder than Botticelli at the opera house. After tripping over him several times, you dump the food into the bowl and your cat attacks it as though it might run away. He sure seems hungry tonight, you might think, and then you head off to do your human things. Later, after you attend to a phone call, you come into the kitchen to discover Hungry Henry crouched on the counter devouring the tuna sandwich you just made for yourself. When you shout and come running, mild-mannered Hungry Henry turns into Church from Pet Sematary — after he’d gone crazy. Hissing, growling, swiping and spitting, your charming kitty seems to be a demon. Nursing your bleeding hand and dumping the mangled and now completely unappetizing sandwich into the trash, you sentence Hungry Henry to lockup in the bathroom and make yourself a new sandwich (minus the cat spit). You might spare a passing thought as to what happened to make your cat go so crazy over food. Why suddenly his stomach seems to be a bottomless pit, and why you feel like the theme music from Jaws ought to be playing every time you go into the kitchen to feed him. Is he really that hungry? How can 1 cat possibly eat so much? Is it even normal? The truth is, it’s not normal. Cats will eat and even overeat when the opportunity presents itself, but on the whole they generally aren’t going to seem ravenous every time you have food nearby. He could be ill; many various diseases can cause behavioral changes in animals. He could be suffering from a disorder called psychogenic abnormal feeding behavior. Or he has read way too much Stephen King when you’re not at home. Clearly, if your cat is not only ravenously devouring his food but also other pets’, and has cleared out every mouse in your house, there is a problem. The trick is determining what the problem might be, as well as how not to lose a pound of flesh protecting your own meals. There are a few options to revert Hungry Henry to normal eating behavior. First, talk with your veterinarian. It can’t be stressed enough how important your cat’s vet is in any concerns or diagnoses regarding your animal. There is no question too stupid to call and ask your vet — trust me, I’ve called and asked just about every question in the book. Don’t Miss: Can Cats Eat Chocolate? Explain clearly what happens at mealtimes and with other food in the house. Let your vet know a timeline, such as “This behavior started about 3 weeks ago,” or “I just noticed this last week.” If your vet thinks Hungry Henry needs testing, she will tell you. Please follow her advice. Make sure your veterinarian understands the nature of the behavior change. You don’t have to describe every wound you have received in gory detail, but do pass along that your cat does not hesitate to take a swipe at you, and not playfully. Don’t freak out. Even if it is a disease, most diseases are treatable — and with some effort on your part, it is very likely that Hungry Henry will return to his mild-mannered self, even at mealtimes. It may not even be a disease; it may indeed be that Hungry Henry has acquired the above listed psychological disorder: psychogenic abnormal feeding behavior. While that sounds horrific, it’s just a scientific way of saying that your cat has a psychological addiction to food. How does it happen? Nobody really knows, but the good news is that with some behavior modifications, it can be cured. In a study published in the Journal of Veterinary Behavior, a case was studied in a cat named Otto. Like fictional Hungry Henry above, Otto displayed severe aggression when it came to food of all kinds. When no underlying cause (like an illness) could be found, the researchers implemented a plan with the pet parents to modify Otto’s obsession. Restrict Otto’s exposure to food of any kind, which meant they couldn’t eat in front of Otto either. Mealtimes were regulated, and no extra food was provided. Spend some quality time with Otto, play with him and interact with him. Reward Otto’s good behavior but ignore his bad behavior. According to the study, after about 5 months Otto was calm when it came to food again and no longer displayed his unnatural food aggression. When it comes to eating disorders, it seems we humans no longer control the market. 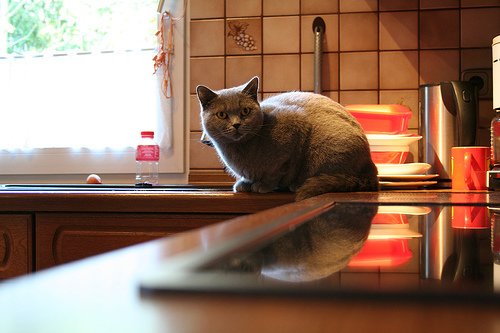 Cats, as well as people, can become obsessed by food. But again, it’s important to remember that in most cases the best thing to do is to reach out to your vet. Oh, and you might want to hide the Stephen King books, just in case.